Concentric bipolar electrodes are excellent for shielded macro recording, as well as evoked potentials. They are especially well suited for bipolar stimulation. 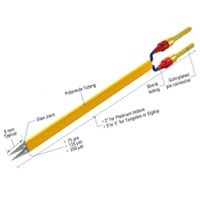 The tungsten electrode is sharpened to a point and is 75μm in diameter. The outer stainless steel conductor is insulated with Polyimide tubing to within 0.2mm of the end of the stainless steel tube. This electrode is also available without the outer Polyimide insulation. A comparison of the concentric electrodes is at the bottom of the page. Concentric electrodes with outer polyimide insulation Concentric electrodes without insulation This figure shows an insulated metal conductor with an exposed concentric surface. Platinum iridium profile A electrodes are sold in packages of 10. Profile A metal electrodes look like the image below. A comparison of the platinum iridium profile A electrodes is at the bottom of the page. Profile C metal electrodes look like the image below. Tungsten profile A electrodes can be used for recording or stimulation. Profile A metal electrodes look like the image below. A comparison of the tungsten profile A electrodes is at the bottom of the page. Tungsten profile B electrodes are stereotrode, bipolar electrodes. They are used for making differential measurements and extra fine recording. Profile B metal electrodes look like the image below. A comparison of the tungsten profile B electrodes is at the bottom of the page. 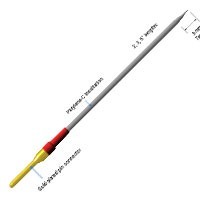 Tungsten profile C electrodes can be used for recording or stimulation. Profile C metal electrodes look like the image below. A comparison of the tungsten profile C electrodes is at the bottom of the page. For basic information on these types of metal electrodes, click here to see the Metal Microelectrode Basics page. 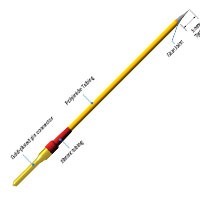 Kapton* tubing, indicated by “KT” in the part number, extends from the connector to within 5mm of the tip, providing stiffness and additional insulation to the electrode shaft. Kapton- clad electrodes are recommended when the electrode is to be inserted through a cannula for extra deep penetration. 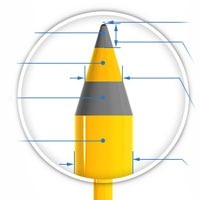 The Heat Treated Tip (see image below) is ideal for penetrating tough membranes. (It is not recommended for chronic implantation.) 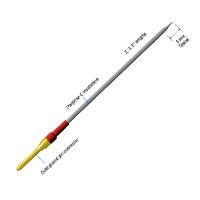 This process is performed using a microforge in which the heating element is positioned in close proximity to the tip in order to melt the Parylene-C distal to the exposed metal. It provides a smooth transition and produces better adherence of the Parylene-C to the metal. Both the KT and non-KT electrodes are heat-treatable. The heat treatment is applied only to the parylene coating. The heat melts the paryleneso it feathers down close to the shank near where the tip is exposed. This removes the abrupt edge where the parylene has been removed tocreate the tip exposure. The purpose is to prevent the parylene from delaminating from the electrode during implantation into tissue which couldcatch on the edge. Heat treatment does not work well in chronic applications, because the feather edge is susceptible to fluid intrusion overtime, which will alter the impedance characteristics of the electrode unfavorably. To have your electrodes heat treated, just add the suffix “H” to any of the “KT” numbers on the facing page. This treatment incurs an additional cost. Please call for pricing. * Parylene is a trade mark of Union Carbide. Kapton is a trade mark of DuPont. Elgiloy is a trade mark of Elgiloy Ltd. NOTE: ALL METAL MICROELECTRODES ARE AVAILABLE IN CUSTOM LENGTHS, BLUNT OR HEAT TREATED. An extra charge may apply.